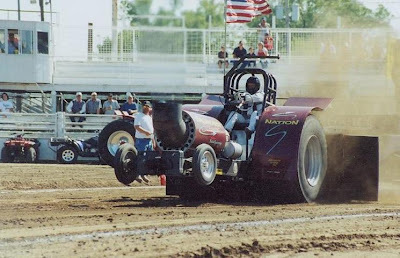 My friend's Dad, Mayberry Jim, sent me this jet powered pulling tractor ad on eBay. First of all, you can always trust Luke's dad to find the good projects, like a 1964 4-speed V8 Falcon wagon or a Pinto bodied big-block dirt late model that's road registered. Anyways, If you can find more reasons not to buy than to buy this rig, you are an idiot. For example, it comes with a Jeep that has been modified to use as a gigantic starter motor. Anything that requires another internal combustion engine, let alone a whole entire damn Jeep just to get it fired up is something worthy of a spot in the garage. It also features a 3,000 horsepower 1960's helicopter jet engine whose every pulling pass likely sounds like a blast down the Ho Chi Mihn trail. As of writing this, the price of 10 grand is not too a bad deal to literally burn down anything on the road. Check here for the ad.